MCX Crude Oil closed at Rs 6395 per barrel, down 1.74%. Crude is now set to reach Rs 6330 and 6280 per barrel in today`s moves. The resistance for Crude Oil is at Rs 6420 per barrel. The correction last night was heavy and further correction is expected in today`s trades. The decline below Rs 6330 will bring fresh supplies in the market. For Long term, Crude is still in a inverted head and shoulder pattern that is considered as a strong technical indicator for price rise. 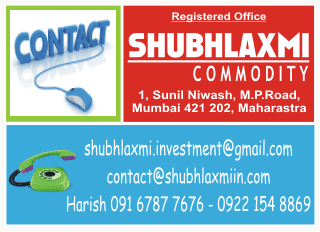 The prices have the potential to reach Rs 6500 and 6600 in medium term range of 1 to 2 months.